Magento Sales Order Grid : Magento Sales Order Grid allows the admin to extend their sales grid. 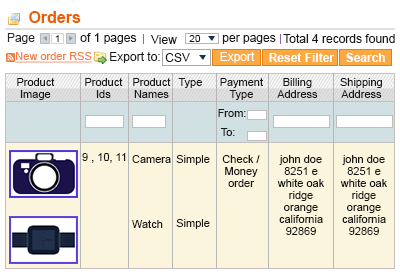 This Module displays the sales order grid with other information about the product order like SKU, product image, email, billing and shipping address etc. 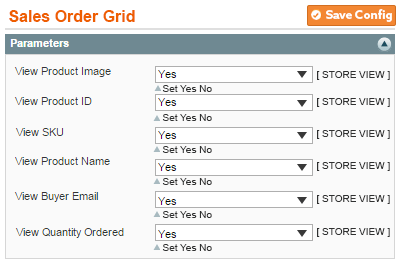 Magento Sales Order Grid -Magento Sales Order Grid allows the admin to extend their sales grid. This Module displays the sales order grid with other information about the product order like SKU, product image, email, billing and shipping address etc. After enabling the parameters, admin can see those enabled parameters in the order grid. Admin can view all the order related parameters in a gist and then admin proceed with the processing of the order (invoice & shipping). Did you buy Magento Sales Order Grid? This is a terrific product. I installed it myself. The directions were easy to follow. There was an adjustment that was necessary to make the product work correctly, and customer service took care of the issue for me immediately. The entire process was delightful. Love this company! Excellent extension. I had an issue and support took care of it for me. Thank you so much. FYI, this works in Magento 1.7.2 for anyone wondering. It was worth every penny to be able to search for orders based on SKU. It was worth every penny to be able to search for orders based on SKU. There was an issue getting it to work with our 1.7.2 CE Magento, but they were able to fix it very quickly. The tech support was very timely and courteous. Give them a try. Worth all the money, Fair value for functions, all work as expected, did not need Support that's why no feedback.